A Buddha-altar isn't only a place to honor one's ancestors. Within the altar, there is an area where Mt. Sumeru (the mountain at the center of the Buddhist cosmology) is represented and in the center of that area the main image is enshrined. In the same way as a temple's main Dharma Hall, the Buddha-altar is “the temple in the middle of the home”. 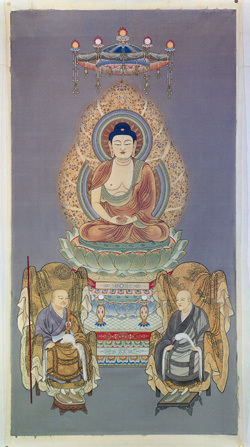 The main image of Soto Zen School is the founder of Buddhism, Shakyamuni Buddha. Shakyamuni Buddha taught us the best way in which to live our lives and is enshrined within the Buddha-altar. In principle, all that is needed is the image of Shakyamuni Buddha. However, if you have a scroll with the images of Shakyamuni Buddha and the two founders of Soto Zen School in Japan, Dogen Zenji and Keizan Zenji, then it is fine to hang that in the center of the Buddha-altar. If there is already an image of Shakyamuni Buddha, then hang the scroll behind that image. With regard to the way to worship at the Buddha-altar, the most important thing to clearly keep in mind is that Shakyamuni Buddha is at the heart of the Buddha-altar. The image of Shakyamuni Buddha is enshrined on the middle of the upper shelf of the altar. The memorial tablets of our ancestors are placed to the left and right of Shakyamuni Buddha. Facing the altar, the older tablets are placed on the right side, while newer ones go on the left side. When there are many memorial tablets, there are different ways these can be combined in one tablet, so please consult with your family temple priest about this. Offerings to both the main image as well as to the ancestors are made as if these beings are present. There are five basic types of offerings: incense, flowers, candles, water, and food (food trays, fruit, sweets, favorite food items, and so forth). Please offer the food that you eat. Such offerings are not restricted only to rice. In order not to waste the food, please share the food among yourselves after the food has been offered. Also, make sure to offer something to the Buddha-altar whenever you receive a gift of something. Offerings of tea and water are placed in the center of the middle shelf. In the case where only one container of liquid is used, place the food to the right of it. In the case of two containers of either tea or water, the food is placed between them. Sweets and fruit are arranged in piles on trays with high bases and placed to the left and right of the containers with liquid. Remember that with regard to incense it isn't smoke we are offering but good fragrance. For those who have difficulty with the scent of incense, try offering incense that is made of other types of herbs. On the lower shelf of the Buddha-altar, place flower vase, incense burner, and candlestick. There is a front and backside of an incense burner. If the burner stands on a tripod, then one foot of the tripod is in front. The book of ancestors' names should be easily visible. Each morning, open the book to the page that corresponds with the day's date. 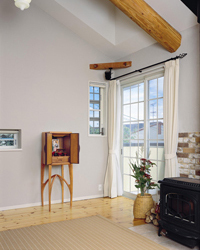 In the drawer below the lowest shelf, place items that are necessary for everyday worship such as a bell, sutra book, rosary, and so forth. During those times when you are worshipping in front of the Buddha-altar, place the mokugyo drum to the right (if you have one) and the bell to the left. If you only have a bell, place it to your right. When there isn't enough space to put things on the Buddha-altar, it is best to put out a small table in front of the altar. This concludes the introduction to the standard way of worshipping at a Buddha-altar. 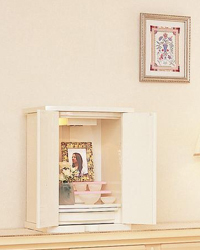 These days, compact altars that are built like household furniture can be purchased. Please ask at your family temple if you have questions about such items.